Chris Hood, Metal Urges is a master jewellery as well as an experienced gemologist. At Halong Pearl Company, Vietnam, Chris observes the pearl farming practices and shares some of his knowledge. It was a pleasure to shot this film while in Tanzania for Metal Urges in Tasmania. Chris Hood is master jewellery passionate about coloured stones. He is also passionate about sharing his knowledge. If you’re lucky enough to go to Tasmania I’m sure he’ll he happy to show you his sapphires from Tanzania. In the meantime, you can see how he has going about collecting stones for his clients in this film clip. 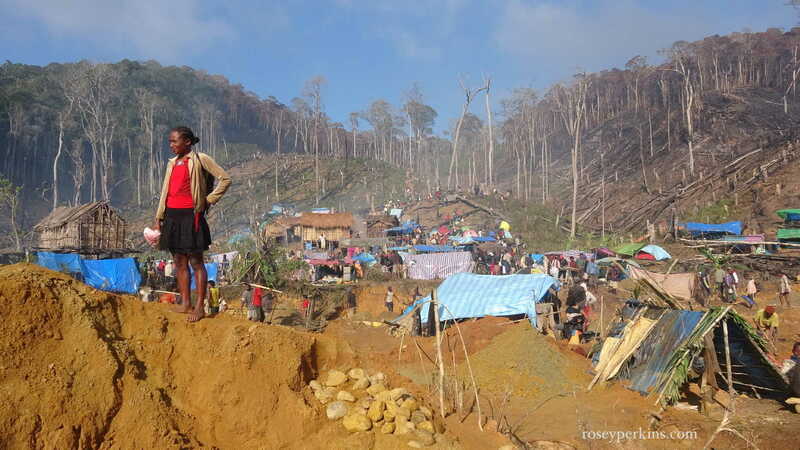 Sapphire mining in Madagascar is largely artisanal small scale mining. Hand tools are usually used instead of machinery and much of the activity is unlicensed. 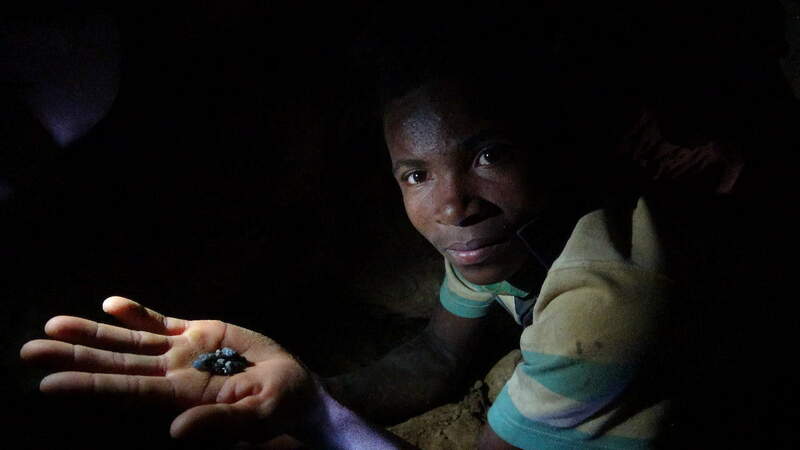 Mining for sapphires took off in Madagascar following discoveries of basalt-related deposits in the north and south of the country in the late 1990s. In recent years rushes have occurred relatively frequently in the east of the island but activity and access is complicated by the protected rainforests, where mining is banned. My interest in Madagascan gems was sparked during a talk Vincent Pardieu gave at GIA Carlsbad, following an expedition he had made to Didy in 2015. In mid September 2016 I arrived in Antananarivo, the capital of Madagascar, with 5 weeks to learn about the country and it’s gem deposits. I would be travelling alone, since GIA’s field expedition, which I had intended to be on, was cancelled. First, I visited the Institute of Gemmology, Madagascar, where Erik, a gemmology teacher there gave me a tour as well as some advice about travelling in Madagascar. I had also contacted MadaClinics, an NGO based in a mining community, which offered to accommodate me. The “polychrome” sapphires (containing more than one colour) from Northern Madagascar intrigued me. I wanted to see them, where they came from and to compare them with my memory of those from Queensland, Australia. Although the sapphires from these regions are geographically distant today, visually they have similarities. Sapphires were found in northern Madagascar in 1996 and a rush soon began. They are blue, green and yellow or violet in colour, (BGY) with some containing a mixture of several colours, referred to as “polychrome” sapphire. 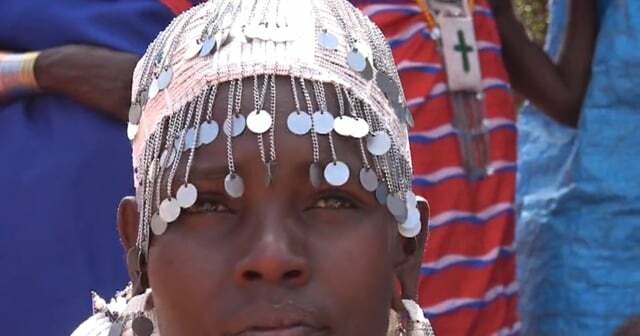 Ambondromifehy (also spelt Ambondrofe) is a gem trading town about 4 hours south by bus (“taxi brousse”) from the region’s capital, Diego Suarez, also known as Antisaranana. In the late 1990s, it had attracted men from all over Madagascar who were searching for work and hoping for a fortune. When I arrived, that excitement had long dissolved, leaving a quiet trading town surrounded by small scale mines. I flew from Antananarivo to Diego Suarez and caught the “taxi-brousse” to Ambondromifehy with Nono, MadaClinic’s coordinator, who was also my guide and translator. We stopped alongside a row of trader’s huts, homes and informal cafes. A trader emerged with tray of faceted blue sapphires for sale and we witnessed some miners bringing their finds to a female middle man who had set up her trading shop/cafe on the side of Route Nationale 6. Figure 2: Female middleman sits in her roadside stand, where she sells simple refreshments such as fruit juices and noodles, while she waits for miners to bring their stones to her. I was glad to be met by Rasta, a local and Adrian the school teacher at Maventibao, who helped us carry our many bags up the hill to the village, which we reached 2 hours later after dark. I was glad to be met by Rasta, a local and Adrian the school teacher at Maventibao, who helped us carry our many bags up the hill to the village, which we reached 2 hours later after dark. Figure 2: Maventibao and the roof of MadaClinics School looking NorthWest. Some time after the initial “rush,” Demco Energy and Mining Company LLC company obtained a mining license near Maventibao but left over ten years ago and now the mining is small scale and informal. Ben Shipley, a former Demco security guard returned to set up MadaClinics, which provides free healthcare and education to the mining community. I stayed with them for 5 nights and my donations for accommodation helped fund the project. Most, if not all of the village were miners and had families, who lived in huts they had built. They dug pits into the sandstone with hand tools and sometimes they tunnelled from there or went directly into the side of a hill. The surface undulated about 20ft and the area, which I spent 2 days exploring by foot, had been mined fairly extensively. The mines were not covered over when finished and Nono told me that people often return to old sites. Several 15ft “fissures” in the rock floor stretched out to a cliff face near the village. I had hopped over one in the dark but I imagined people could fall into them easily. Nono brushed off my concern and told me that was very rare. One miner showed me a tunnel that went 18 feet into a sandstone face. He had found a bluish grey clay, which he took as an indicator for sapphires. Nono dug at the surface of the soil near the village with a stick. Sapphires are everywhere, he told me. The soil is rich with them. Figure 4: Nono and a sapphire sample he found. Adrian, a teacher at the primary school in Maventibao, took me to see his cousins in the village, who were informal miners and were happy to show me where they were mining. We crawled about 12ft into the tunnel, where his cousin and uncle were digging with spades into the side of a small cave. Figure 5: A miner at Maventibao showing me rough stones he had found. They took me from their mine to the river, where his aunt and younger children helped sieve the gravel. They were collecting the sapphires into a small plastic pot, which they took into Ambondromifehy to sell. It was the school holidays and this little girl had been helping her parents mine for sapphires. She proudly showed me her sapphires, ones she had pick out from her father’s sieve in the river near her home. Her father watched over her and sieved his pan. Figure 9: A miner checks his stone carefully. The majority of the sapphires I saw at Maventibao were very small: less than 0.3 carats and was quite “included”. Miners living in Maventibao were not seeking a fortune. It was a simple way of life but with the riches of the ground and the help of MadaClinics they had the basics. I explored other villages around Ambondromifehy by foot and found one mining village east of the town, called Makanue, particularly interesting. There, shafts were up to 40 meters deep, they told me. I didn’t go down because they were all working. One team of miners had worked around the clock for over a week in shifts, giving oxygen to the miners below via a plastic “air sock” (figure 11) and resting in a make-shift tent when “off duty”. Of the stones I saw at a mine site in the area around Ambondromifehy, the purest and most saturated blue sapphire that cut above 1 carat came from here. The hard labour was done by men, while women checked the sieve. Often, it was a family affair but one camp we came across had been set up by a group of boys, who looked like they were in their early 20s. Many traders had set up in Ambondromifehy but some walked towards the mining areas and sat in a hut for the day, waiting for the miners. Anzhannako is another trading hub along Route Nationale 6, on the edge of Ankarana National Park, where mining was taking place, I was told. I did not visit but I was told that it was tolerated there. Other areas were protected by the Gendarme (military police). In Anzhannako, traders showed us stones, among them were a +10 carat sapphire, some small star sapphire rough and one blue dipyramidal sapphire crystal. Figure 14: Stones from traders at Anzannako. I looked for a gem cutter in Ambondromifehy and found one but he was only able to cut cabochons, so it seemed that the faceted stones offered on the road side by traders in Ambondromifehy were likely to have been cut in Diego. Xiang, a Chinese stone dealer, showed me the stones his broker brought him, most of which were garnets and sapphires but I saw a very small trapiche-type blue rough stone among them. He described the sapphire mining areas he had visited in Madagascar and was especially interested in Antsirabe, a small village in the forest of NorthWest Madagascar, near Ankaramy-Be. He offered to take me there if I helped him improve his English and I agreed. Thank you to friends who worried about me on the trip. It was a dream of an expedition to go on and I’m looking forward to more. Many thanks to Vincent Pardieu for his training on previous field expeditions, for his support and for telling me to go north first. Had he not, I may not have seen these places. Andrew Walsh, thank you for your advice and for telling me about MadaClinic and to Nono, Adrian, Mama Flavi and all those who welcomed me. MadaClinics are always looking for volunteers and can be contacted via their website or facebook page. This article is about the experiences of the author and the information she gathered on her trip to the mine site. Any views expressed are only the author’s opinions. Her information is dependent on the people she has met – so are the spellings of the village names. If information in this article is proved incorrect, incomplete, biased or offensive it is not the authors intent. The aim of the article is to record and share this personal and unusual experience. Hughes et al., (2006) “Sorcerers & sapphires: A visit to Madagascar.” The Guide, Vol. 25 (Issue 1, Part 1, Jan–Feb): pp. 1, 4–6. Schwartz et al., (2000) Sapphires from Antisarana Province, Northern Madagascar. Gems and Gemology. 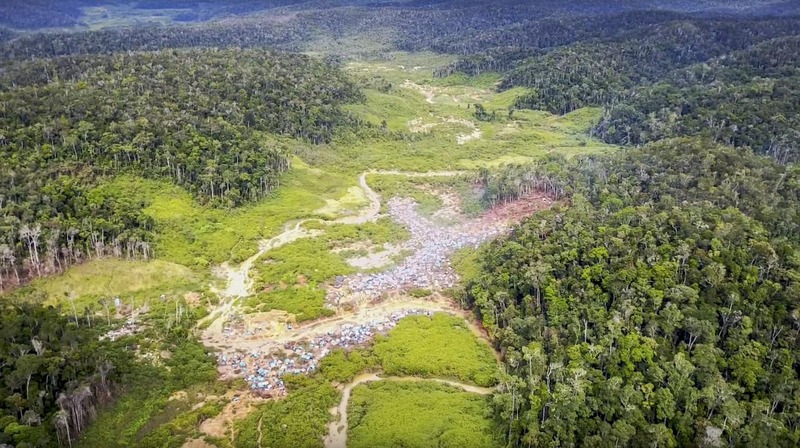 A “sapphire rush” which has escalated to approximately 45000 people occurred in the east of Madagascar, near Ambatondrazaka, last month. Blue and sought-after orangish-pink sapphires +100 carats (the size of a squash ball) are reported to have been found there. I was one of many, among miners, food sellers and porters to walk 12 hours into the jungle and to live alongside miners in a make-shift tented community. Living conditions were basic and there was no sanitation. I photographed the mining activity but it dawned on me in the throng of people that while my search had been for sapphires, the scene was much more complex than that. This mining site is in an area under international protection for conservation. Madagascar is home to some of the most diverse and rare flora in the world. When the ground is shared with precious stones and poor people, conservation is not a simple formula. “You can’t talk about conservation to hungry people,” said Colleen Begg of Niassa Lion Project…and these people were certainly hungry. I saw toddlers, mothers and grandmothers make their way along the 35 km jungle track in flip flops, jelly shoes or with nothing on their feet at all. Their motivation went deeper than hunger. They do not trust their Government: one miner at the site even told me he was working quickly because the Government would soon take over and then [he believed] they would mine it for themselves and for their own profit. In 3 days I saw no violence, it was just a hive of industry in one of the World’s last rainforests. Mining in a protected area is an offence that could lead to imprisonment, but in such numbers little could be done to deter the miners. The Gendarme did not have the physical capacity to evict them. For the miners, sapphires weren’t the end game, they were the facilitator. This was their chance to elevate themselves; everyone had come to this site with a problem to fix. One miner introduced himself as a law student. He told me that for several years he had been unable to pay the bribe his university had asked from him. He needed to find a stone in order to graduate. Another said he wanted a car. The atmosphere was frenzied, as people anticipated a lock-down from the Government, which held a responsibility to protect the land. There is however, in general, a disconnect between the theoretical penalties of mining in protected areas and reality on the ground. Cheers of self encouragement rose from the miners at work and in them I heard empowerment, there was sense of political populism. In the past, law enforcement has occasionally led to further environmental problems. It’s not only the mining that impacts the environment but also the consequences of large numbers of people seeking supplies: wood for building houses and charcoal for cooking as well as food. On my way back to town, I passed several goat herders bringing meat to the miners. If the meat supply had been insufficient, the miners may have turned to bush meat. 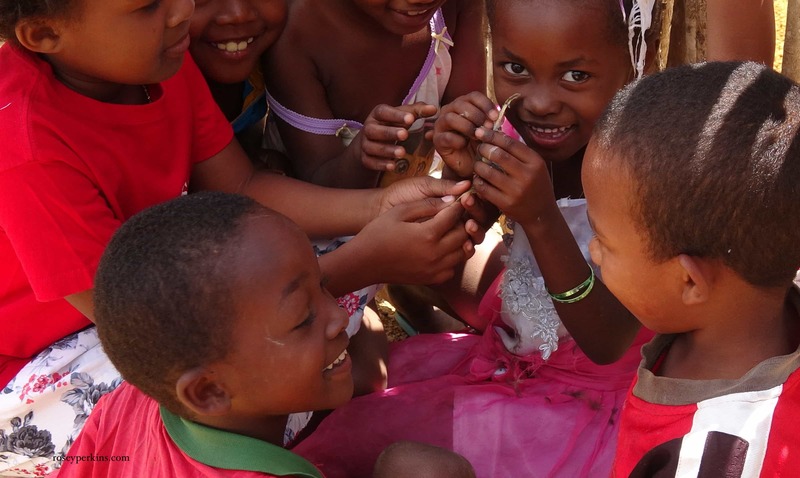 Madagascar’s rich gem soils are, as if Murphy had planned it, concentrated beneath an area essential for the survival of rare and endangered species. “Why don’t they plant trees on the West of the island where there are no sapphires,” asked a miner in earnest. For local people mining is a much needed source of income and the populist sentiment there says it is their right to mine “their” soil. But Madagascar’s rich biodiversity is one of it’s main attractions for tourists and damaging that would lead to serious economical consequences for the country. Having visited and spoken to people at Gemfields’ mine in Mozambique and their London HQ, it’s clear the situation isn’t as simple as providing employment or alternatives. Their research into informal miner’s motivation for work suggested that a formalised mining job in a larger mining company would not necessarily satisfy many miners, who may be driven by dreams of finding a fortune, or supplement their main income as subsistence farmers during a period their farmland is unproductive. The demand for traceability is driven by the jewellers, but to formalise such mining is to demand a cultural shift and changes to local mining laws, health, safety and export conditions which only larger producers can currently respond to. Rushes in Madagascar occur frequently and in remote areas. “Madagascar is a difficult country with frequent conflict between conservationists and the gem industry. As it is one of the poorest countries in the world, it is a complex problem,” said Vincent Pardieu (GIA) who travels to mining areas across the globe to build a reference collection for the origin determination of ruby and sapphire. If this rush leads to further dialogue between conservationists and gem industry leaders, it would hopefully be positive for Madagascar.